Mayor John Henry has proposed to turn the back wall of Kinsmen Stadium into a space where graffiti artists can try out their stuff legally. 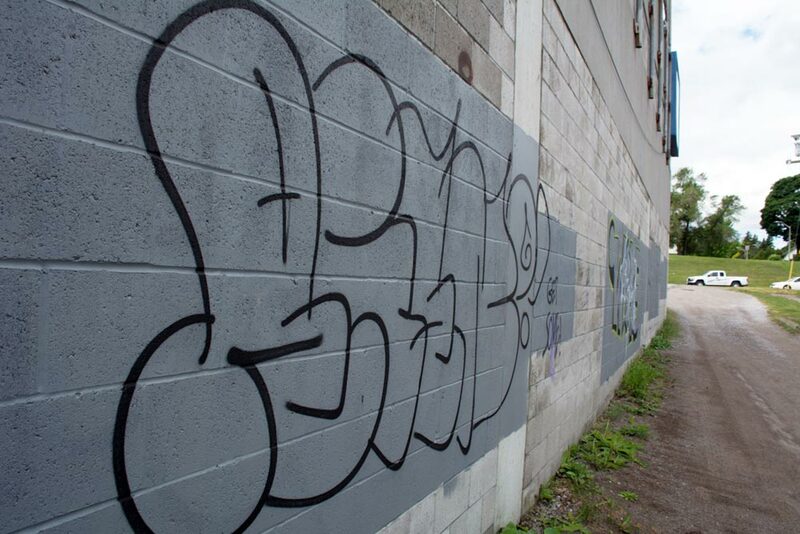 Councillor Dan Carter, however, says a legal space for graffiti art could lead to more tagging, seen above, spreading to other parts of the city. The Oshawa Creek path behind Kinsmen Stadium may soon be getting a burst of colour. At the request of Mayor John Henry, and carried unanimously through the community services committee, the city, in conjunction with the Robert McLaughlin Gallery and Living Room Art Studio, is looking into the possibility of using the east side of Kinsmen Stadium as a legal graffiti wall. “It’s my hope…that this would be the only site and we could, through legislation, make it the only available site in the city for graffiti,” Henry said. This is not the first time Henry has tried to push forward with such an idea, bringing a similar motion before council in his first term as mayor. However, it was shot down at the time. Now, after attending a graffiti-inspired event at the Living Room Art Studio, Henry wants to move forward with the idea once again. “I think it was the mindset of the day,” he says, noting graffiti was not appreciated at the time as an art form. The idea had Councillor Dan Carter concerned that having one legal space could encourage more graffiti throughout the city. As an owner of property in the downtown, Carter says he knows the expense and the hassle involved with trying to clean graffiti off a building, having previously dealt with the problem himself. But Henry is convinced the wall would have the opposite impact. “Graffiti artists are incredible about policing their own stuff,” he says. A report is expected to come back from staff at a later date. Legal graffiti walls are not a new concept, with municipalities across the country designating these “free walls” as open terrain for graffiti arts. Cambridge, Toronto and Ottawa each have multiple free spaces, along with big cities in the west like Edmonton, Vancouver and Calgary, who has had free spaces similar to this since 2009. Can you spot the wisest saying?